New publication edited by: Cláudia Sarrico, Pedro Teixeira, António Magalhães, Amélia Veiga, Maria João Rosa and Teresa Carvalho. How do governance regimes steer higher education institutions? 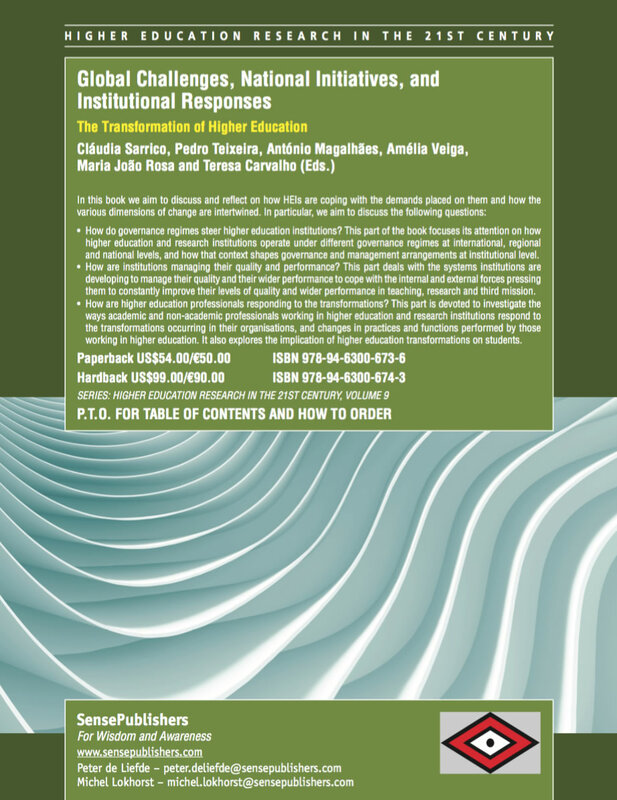 This part of the book focuses its attention on how higher education and research institutions operate under different governance regimes at international, regional and national levels, and how that context shapes governance and management arrangements at institutional level. How are institutions managing their quality and performance? This part deals with the systems institutions are developing to manage their quality and their wider performance to cope with the internal and external forces pressing them to constantly improve their levels of quality and wider performance in teaching, research and third mission. How are higher education professionals responding to the transformations? This part is devoted to investigate the ways academic and non-academic professionals working in higher education and research institutions respond to the transformations occurring in their organisations, and changes in practices and functions performed by those working in higher education. It also explores the implication of higher education transformations on students. New publication by Patrick Clancy, Irish Higher Education: a Comparative Perspective. Institution, idea, possibilities (Foundations and Futures of Education). New publication by Roger Geiger, The History of American Higher Education: Learning and Culture from the Founding to World War II. Dear CHER audience, you can download our newsletter #2 by following the link bellow. CHER newsletter keeps you informed about our events and happenings.